A few weeks ago I spoke about serving God with little ones. One of the best ideas I have seen others do is this idea of "Happy Mail." It is simply sending small packages and/or notes to friends. A few years ago my my grandmother passed away. My church family flooded my mailbox with cards. I realized that this outpouring of love spoke to the heart of these people. In this world full of screens, keypads, digital mail, and text messages, receiving physical mail is so much sweeter and thoughtful. It takes a little more effort to hand write a note, address it, stamp it, and send it on its way! After getting so many thoughtful cards from my friends, I thought that this idea of Happy Mail would be a great way that I can show God's love to people as well. Another aspect of Happy Mail is that it is does not need a reason. Sending cards to our friends for special occasions, such as marriage, pregnancy, or loss, is one thing. Sending cards and little gifts *just because* is a special way to show God's love and care. We do not know what others are facing day after day. One day last month I woke up around 3AM with the song "It is Well" stuck in my head. It was so timely as I was up late the night before worrying about different things....the adoption, school, and life in general. I knew immediately that the song was God singing to my heart, whispering truth into the night. I had not been listening to that song nor had we sung it in church. It was so comforting knowing that He saw me worrying - and was quick to reassure. During the day, I had to open the hymnal and play the song through. 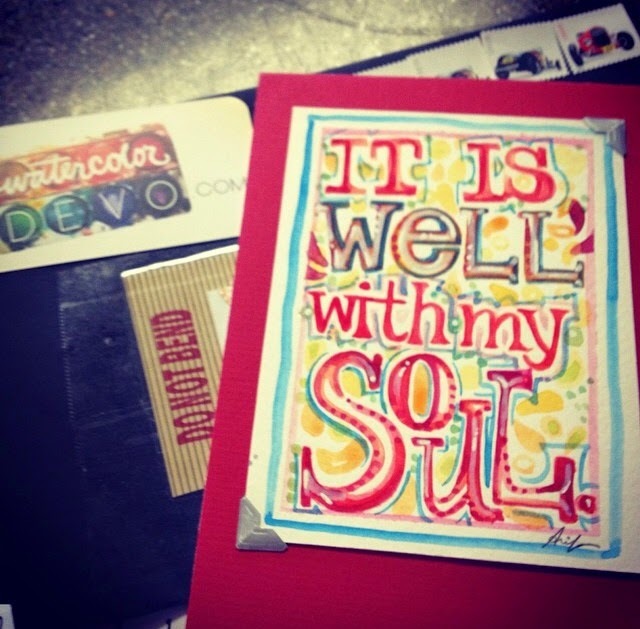 Later, I opened my Instagram account and found a picture of a water color with the words "It is Well with My Soul." It was done by Watercolordevo. I commented on her picture and the next thing I knew this came in the mail! What a wonderful surprise to my day!? It had been a long work day for Jason (and by default, for me too!) It was amazing to see God remind me again how much He loves me, cares for me, and thinks about me. 1. Make a list of people that you would like to send happy mail to each month. 2. Use your list to plan out how often you will send it. 3. Stock up on cards whenever you see them on sale. 4. Pick up extra candy, gum, or mixes when you go to the store. 5. Check the sale section at your local stores for discounted notepads and cards. 1. Sending a card just to say "Hi!" 2. Sending a little gift card to a friend going back to school/work. 3. Sending a care package to a college student. 4. Sending a friend some chocolate. 5. Make a little craft for a friend. 6. Send some homemade dip mix or soup mix to someone feeling under the weather. What other "Happy Mail" ideas do YOU have? What "Happy Mail" have you ever received? I want to send YOU some happy mail! Comment below and I will pick one person to receive a special package from me. You have until this Friday (Oct. 3) to enter.